With the encouragement of Martin Edwards, I borrowed (via the magic of Interlibrary Loan, as it is no longer in print) Crime in Good Company (1959), a collection of thoughtful essays on the art of mystery writing edited by Michael Gilbert and featuring not only the expected (Chandler's "The Simple Art of Murder"; the ubiquitous Julian Symons) but also several delightful pieces from unanticipated quarters (Cyril Hare on the classic mystery; Mary Fitt on the mystery radio play--remember those? ; David Alexander's "Is Television Necessary?"). 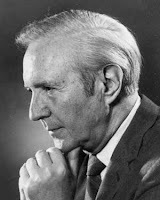 Sadly, most of the contributors are no longer with us, with the exception of Jacques Barzun, who celebrated his centenary in November 2007. There's ex-cop Maurice Procter (Hell Is a City) on the policeman's view of the criminal. Author-poet L. A. G. Strong's praise of Margery Allingham (". . . Allingham's 'One Morning They'll Hang Him,' with a looser texture and a more leisurely pace than those of most American writers, achieves an enviable symmetry, and her red herring, the call at the chemist's shop, is slipped in with Chekhovian adroitness"). Barzun grousing about the authorial preoccupation with the psychological problems of the detective that detracts, in his view, from the story ("Do I look like a couch?"). I enjoyed Gilbert's summing up of the modern bad guy ("Modern villains, like Socialist cabinet ministers, have now to go to the best Public Schools. They are large, suave men, men who change into dinner-jackets most nights of the week and have acquired their skill with firearms competing for the Ashburton"). He also displays the art of the lively introduction, such as these descriptions of American contributing author Stanley Ellin ("He looks not unlike a large brown bear, is a philosopher, and excellent company") and British espionage master Eric Ambler ("[Ambler] says that he was an unpleasant child, but produces no evidence of this beyond a single attempt to blow up his own house with nitroglycerin"). Crime in good company indeed. About the photo: Jacques Barzun, former provost of Columbia University. Terry Pratchett; France pledges to save independent bookstores. Author Terry Pratchett, who has been diagnosed with early-onset Alzheimer's disease, has pledged 494,000 pounds (approximately US$979,000) to fund research. Further details here. France has inked a deal that would prevent chains from taking over independent bookstores when owners retire. Further details here. Michael Dibdin, the creator of Italian police commissioner Aurelio Zen, was born today in Staffordshire in 1947. He died in March of last year. The last of the Zen novels is End Games (2007). A recipient of the British Crime Writers Association's Gold Dagger for Ratking (1988), Dibdin also wrote A Rich Full Death (1986), which cast poet Robert Browning as a detective in 1855 Florence. In Mystery Scene #71 (2001), Robinson gives a colorful account of how his first novel, Gallows View, sold, which includes the marvelous line, "The receptionist [at Penguin Canada . . .] offered me some small change to go away." 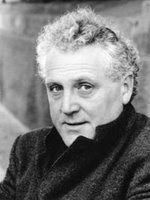 Lawrence Sanders, Edgar winner for The Anderson Tapes (1970, film 1971), was born today in Brooklyn in 1920. He died in 1998. His many novels include The First Deadly Sin, The Sixth Commandment, and McNally's Secret. On February 29th, former State Department employee Samuel Hamrick Jr. died of cancer at the age of 78. As author W. T. Tyler, he produced several spy novels, including The Man Who Lost the War (1980), Ants of God (1981), Rogue's March (1982), The Shadow Cabinet (1984), The Lion and the Jackal (1988), Last Train from Berlin (1994), and The Consul's Wife (1998). He also wrote a nonfiction work, Deceiving the Deceivers: Kim Philby, Donald Maclean, and Guy Burgess (2004). Yet another piece on chronic carouser Branwell Brontë as the genius behind Anne, Emily, and Charlotte (Branwell was the model for the wastrel husband in Anne's Tenant of Wildfell Hall). Malvin Wald, cowriter of the Oscar-nominated screenplay for The Naked City (1948) with blacklisted screenwriter Albert Maltz, died on March 6th. He was 90. This gritty film, which followed the investigation of a model's murder and starred Barry Fitzgerald and Howard Duff, spawned a TV series with the memorable tagline, "There are eight million stories in the Naked City." The History of Medicine Division of the National Library of Medicine is offering an exhibition, "Most Horrible and Shocking Murders! ", which features true-crime murder pamphlets from the library's collection. It runs until June 15th. More information appears here. 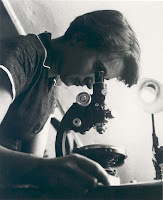 The division also has some fascinating online exhibitions, such as "Visible Proofs: Forensic Views of the Body," "Cholera Online: A Modern Pandemic in Text and Images," and "Diseases of the Mind: Highlights of American Psychiatry through 1900." Nonfiction prose master and Pulitzer Prize winner John McPhee was born today in Princeton in 1931. 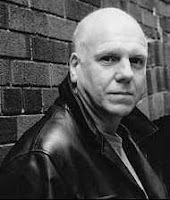 A regular writer for the New Yorker and once a playwright on Robert Montgomery Presents, McPhee has more than 20 books to his credit; his latest is Uncommon Carriers (2006). He's also spawned something of a literary dynasty: several of his children are writers, including daughters Jenny and Martha. LA Quartet and Black Dahlia author James Ellroy turns 60 today. Ellroy is currently working on a follow-up to his novel The Cold Six Thousand. 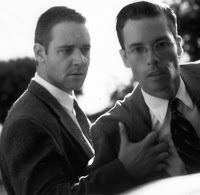 Photo: Russell Crowe (left) and Guy Pearce in James Ellroy's L.A. Confidential (dir. Curtis Hanson, 1997). Author-screenwriter David Goodis was born today in Philadelphia in 1917. Among his several gritty works, he is probably best known for Dark Passage (1946; film with Humphrey Bogart and Lauren Bacall, 1947) and Down There (1956; filmed by Francois Truffaut as Shoot the Piano Player, 1960). He died in 1967. For a summary of Goodis v. United Artists Television (that deals with the copyright infringement case of the United Artists adaptation of Dark Passage into the TV series The Fugitive), go here. Happy birthday, Nevada Barr; William Dean Howells. Agatha and Anthony Award winner Nevada Barr, the creator of park ranger sleuth Anna Pigeon, turns 56 today. Her latest novel, which will be out April 1st, is Winter Study. 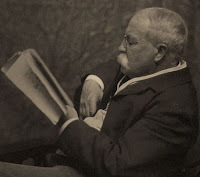 And Atlantic Monthly editor and critic William Dean Howells was born today in Ohio in 1837. Author of The Rise of Silas Lapham (1885) and other novels, he also edited one of the earliest round-robin novels, The Whole Family (1908), with contributors such as Mary R. Shipman Andrews, Mary E. Wilkins Freeman, Henry James, and Elizabeth Stuart Phelps. He promoted the work of Henrik Ibsen, Henry James, Leo Tolstoy, Mark Twain, and Emile Zola, among other writers, and was a member of Boston's Dante Club. He died in 1920.